Harry met Alan were together 24 years when they were finally able to legally wed in Florida. I’m so lucky to be marrying you. It’s nice to hear when a couple is together for so long in today’s world. 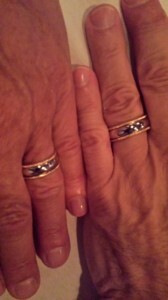 We recently celebrated 40 yrs of marriage. Congratulations Debra! I wholeheartedly agree. My husband and I will be celebrating 30 years of marriage this September.